Yep, dad though the ol son needed to get behind the wheel. A friend of ours gave us a really small bike but Ean just couldn't figure it out. So, I thought maybe something a little closer to the ground would help. He actually was able to steer and make himself go a little the night we got it. I haven't had a chance to work with him since. He's at that age where you either want to put him in his room for a little disciple or shake your head in amazement at how much he is learning. Dad is starting to wonder he can start teaching him some phonics. The world will only open up the day he starts to read. I sure wish I started reading a lot earlier in life. Oh well... just one life to live before heaven. 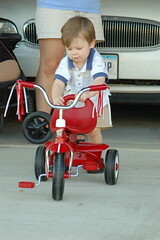 I bought Malachy the same trike! He can't ride it at all very well, but he likes it a lot!